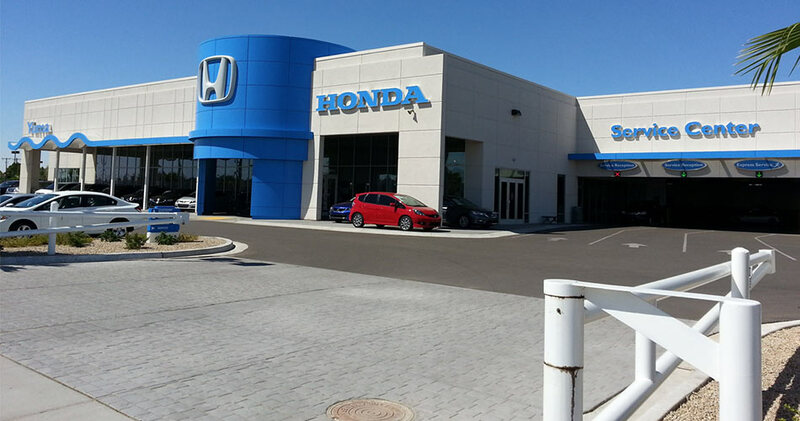 Yuma Honda is proud to serve Yuma, AZ area car shoppers with a large selection of new Honda vehicles at low prices. From the new Civic, Accord, Fit, CR-V, and HR-V, to the Pilot and Ridgeline, we have all of Honda's latest models in stock in a variety of colors, trims, and packages. 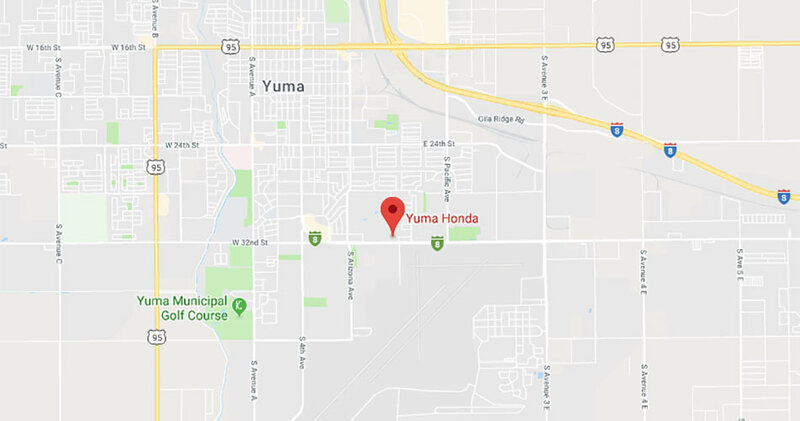 Discover your new Honda in Yuma today by browsing our current inventory online; then visit our Yuma, AZ dealership for a test drive. Even before your test drive of your shiny new or pre-owned Honda, you can get pre-qualified for auto financing, thanks to our online finance application. When your Honda needs expert auto service or genuine Honda OEM parts or accessories down the road, turn to Yuma Honda! If you're wondering if it's better to buy or lease, our finance department is here to answer questions pertaining to a range of credit scores. Ask about our credit-challenged financing options for less-than-perfect credit scores near San Luis and Dateland. From new model research material to OEM auto parts for sale to quick auto appraisals, Yuma Honda is here for you. When you want professional auto mechanics to maintain your used Honda Accord to factory specifications, get in touch with our service department. From new minivans to new compact SUVs, our Yuma, Arizona Honda dealership is fully-stocked with new automobiles. After you pick out the new Honda Odyssey or Accord sedan you love, you can appraise your trade-in value in minutes. Selling your car to our dealership is a quick way to lower your downpayment. When you're ready to apply for a car loan to finance your new Honda Civic sedan, our Arizona Honda dealer will help you find a lease deal on new cars. Contact our finance department to receive the helpful assistance you deserve. You get the ball rolling from the comfort of your home. Simply complete and submit our secure, online credit application. Many Honda drivers enjoy installing aftermarket parts and performing their own auto maintenance. The next time you plan to wrench under the hood of your used Honda Ridgeline, stop by our parts department. The trained specialists in our parts department are here to make sure you take home the right parts on your first trip. If you know the spark plug or engine oil filter you need, you can order your new auto parts directly from our website. If you aren't sure which size wiper blades you need, just call our parts department. We're happy to help. Find a stylish used Honda at our Arizona used car lot. Yuma Honda is proud to offer a range of reliable used cars for sale. We stock our inventory with used Honda crossovers as well as pre-owned models from other manufacturers. Every used car we sell goes through a rigorous, multi-point inspection for performance, reliability, and safety before you take the wheel. Tell us about the pre-owned SUV or used truck you're dreaming about. Our local Honda dealer is proud to offer a state-of-the-art service department. We staff a team of factory-trained auto mechanics who will maintain your new Accord to factory levels. From significant engine repair to routine brake jobs, our team is here for you. Don't miss our money-saving service deals and parts discounts when you make your appointment. When you're due for an affordable oil change or car battery test, schedule your tire rotation online. Our comprehensive website is your one-stop automotive resource. Here, you can research standard trim features, apply for Honda lease deals, calculate your lease payment, and order auto parts from your desktop computer. Reach out to our team with any questions you have. We hope to hear from you soon.